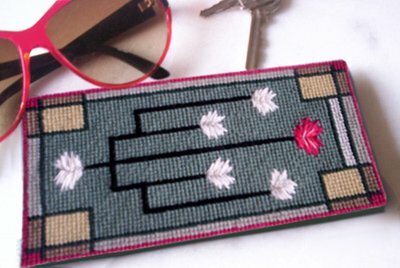 Are you looking for unique designs for needlepoint seat covers to suit the style of your home? 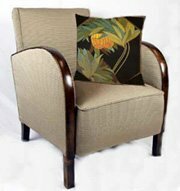 Seat covers for upholstering your dining chairs or piano bench? 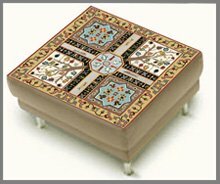 …Or to cover your favourite footstool? 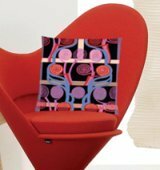 Maybe you want to stitch a seat bench pad to coordinate with the rest of your interiors? 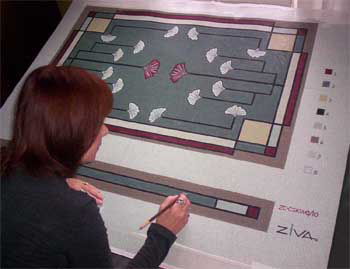 Here, I'm painting the finishing touches on the canvas for a large custom seat bench design called 'GINKGO LEAVES' (see below). 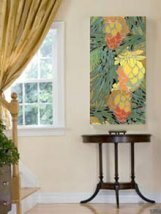 I created it in the Prairie Style as a custom design for the foyer of a Prairie Style house. 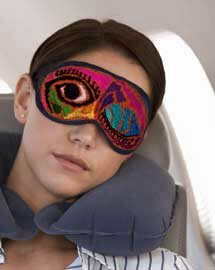 What seat cover design are you looking for? 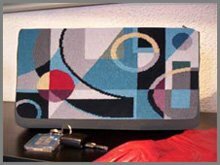 NOTE: All the needlepoint seat covers can be made up as upholstered seats or as seat pads. YOUR CHOICE! 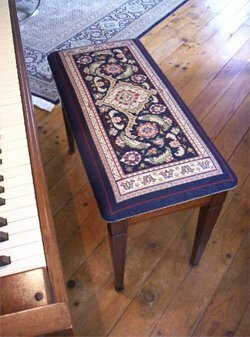 I’ve adapted the design elements from an existing oriental carpet to create an elegant seat cover for an 80 year old piano bench. The dark blue background suited my home, but what about other background colours? 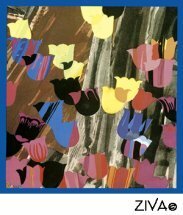 I’ve just painted two canvases with other background colours for this design which my clients had requested to suit their own décor. 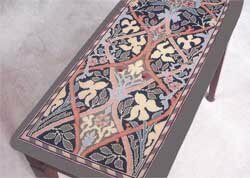 This beautiful Persian motif makes a stunning window seat pad cover as well! 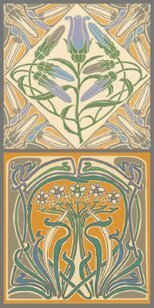 The graceful proportions and colours of this William Morris design are well suited to creating an exquisite needlepoint piano bench cover. 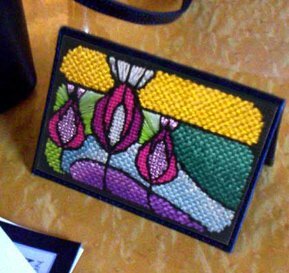 The ordered geometry of the Prairie Style creates needlepoint seat covers and seat pads with a strikingly simple and dramatic effect. 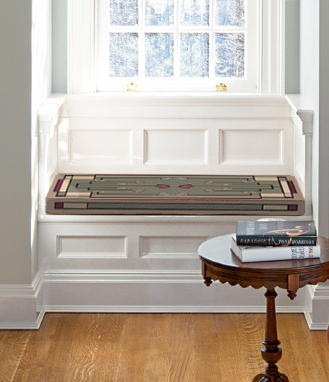 The window seat pad at right is the "GINKGO LEAVES" design.... one of six designs created in this very American style from the early 20th century. 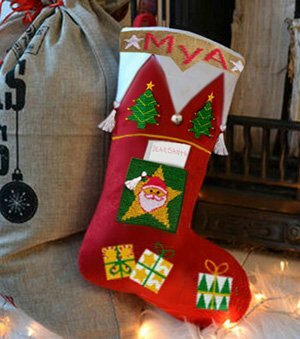 Perfect for today’s homes, whether traditional or contemporary! 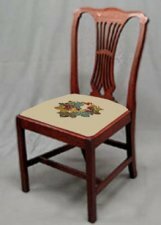 Add an elegant and unique French Country touch to your dining room chairs! 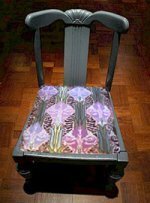 My love of the French countryside, with its vineyards, orchards and gardens inspired me to create 6 NEW STYLIZED chair seat cover patterns with classic French flair. 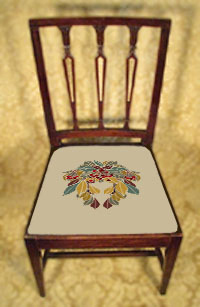 I've just added 3 more French Country theme designs for dining chairs, many in an Art Nouveau style. 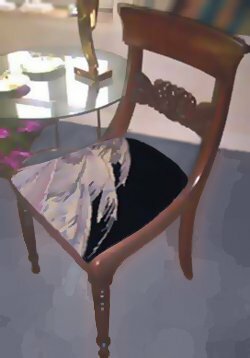 I’ve created a free-flowing pointillist design for a client’s existing neo-classic mahogany side chair. 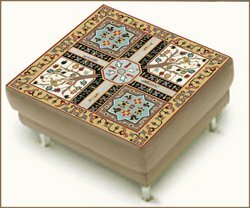 I’ve created a variety of classic Persian and Kilim footstool designs, both square and rectangular…one could fit your décor! 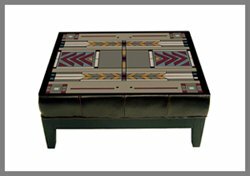 I’ve added two striking Prairie Style designs to this ZIVA Footstool Collection… timeless designs from the early 20th century American architectural style. 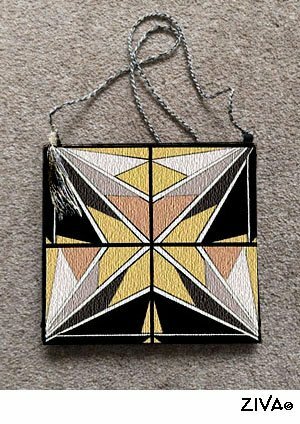 Have a look at these bold geometric designs! This is just the beginning of the seat cover designs I'll be adding to the site! 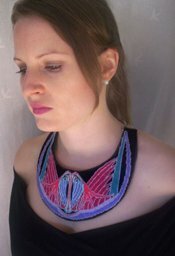 Remember CUSTOM SIZES AND DESIGNS are also available! 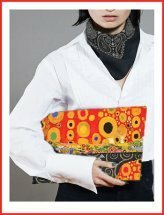 Click here to GO SHOPPING FOR FOOTSTOOLS with ZIVA! 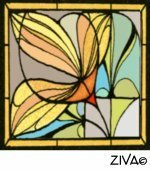 Click here to GO SHOPPING FOR SEAT COVERS with ZIVA! 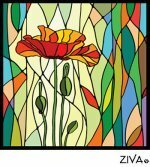 Now you've seen these unique needlepoint seat covers, please go back to Home Page to see other needlepoint designs in the ZIVA Collection.